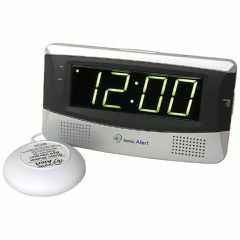 The Sonic Boom is a cost effective bedside alarm clock with an extra large (1.8”) easy to read display and bed shaker. Big, bright 1.8" green LED clock display. Snooze Button - 9 minutes. 12-volt bed shaker – Our most powerful. 29 minute auto shut off. Extra loud audio alarm - loud 113db adjustable tone & volume control. Battery backup (9 volt not included) - maintains time and alarm setting in the event of power failure. Not as loud as i hoped. Durable. Good Value. High Quality. Being hearing impaired, this fills my present needs and there is still more it offers for future needs. High Quality. Neat Features. Good Volume. Easy To Set. Reliable. this is the only clock that has ever been able to wake me. both my kids now own one along with my aunt. I have recommended it to several sound sleepers since I could not live with out it. Wake Up Alarm For Work. I liked this alarm clock for the first 3 days or so, and then unfortunately the darn thing shorted out! No Buzz, no vibrating shaker, only the time works now. Loud and time is visible. Good Value. My 96-year-old mother can see the time and can hear the alarm. If she unplugs it by accident, she doesn't have to reset it. Does this clock need to be plugged in or does it run on batteries?